When we were in New Orleans this weekend Jane and I checked out a furniture store on Magazine Street. 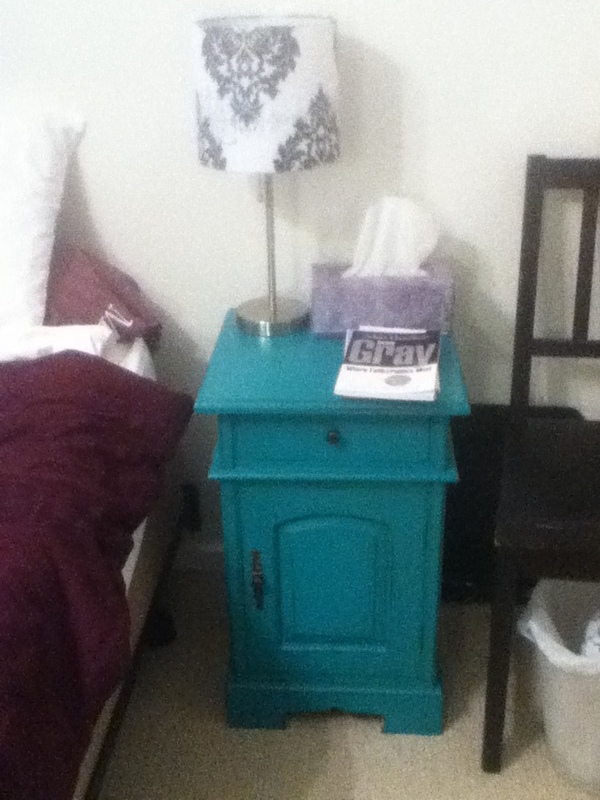 I scoped out this little nightstand on Friday when we were on foot, fretted about it and went back on Saturday to buy it when I had the car. It's super turquoise and super functional. I had been waiting until we got a full bedroom suite, but realizing that isn't a priority but that I still wanted more function beside the bed I started the hunt. I'm really happy with this and if we ever do get a matching set of bedroom furniture this can always go in Jane's room. Although I can't imagine I'll ever want to give it up! We're also in the market for a china cabinet -- and there was definitely a contender at this store. We're looking for small-ish footprint, dark wood, blocky/clean lines with drawers, lower cabinets and glass-front upper cabinets for display and glass storage. We might like to have a buffet surface too (the contender here didn't offer that). I keep checking Craigslist and maybe need to look at thrift stores and estate sales. I'm super cheap, which is why I didn't just buy the one at this store. It would be great to have something though so my fancy wedding china wouldn't still be sitting in a box in our utility room. Oh me. Just FYI, I awoke this morning to "66 new (email) messages" on an account which seldom gets any e-mail at all. Most (of the addys) were imPLYING that I'd tried to send a message which FAILED to send. Of course there was nothing recent in "sent messages". Amid the collection was ONE message which suggested that it came from your email addy (which didn't look at all like it originated from human hands). I am only letting you know this in CASE you might have clicked on a link from somebody in recent days. The "66 new messages" seemed to come in rapid-fire, ending at what would be 8:15am-ish your time on Weds. morning. I don't think anything has happened to meeee-EEEEEEEEE, or to my account... but of course I can't know whether 66 more messages will arrive.